Maximum flexibility and reduced assembly costs are achieved in this cost effective range of crimp d type connectors through full or partial loading of selectively plated stamped and formed or fully plated machined pin contacts. Crimp contacts are assembled by inserting a stripped wire end into a cavity in the rear of the contact, then crushing the cavity using a crimp tool, causing the cavity to grip the wire tightly at many points. The crimped contact is then inserted into the connector where it locks into place. Individual crimped pins can be removed later by inserting a special tool into the rear of the connector. As well as loose for hand crimping tools, contacts are available in reels of 10,000 for use with auto crimp machines. Accepts wire sizes of 20 to 28 AWG – offers greater flexibility. Replaceable contacts – no connector wastage. Tinned and dimpled shell options – for effective EMI/RFI shielding. Complete selection of crimp tooling enables quick assembly. Wire strip length 2.4 ± 0.2mm. ‘Reeled’ contacts for auto cut/strip and crimp machinery. Individual contact (in isolation) 3A @ 70ºC Tamb. All contacts simultaneously 2A @ 70ºC Tamb. Ironically, applications for crimp D-subs range from the home user to high end avionics. Many DIY users prefer crimp style D-sub connectors over the solder bucket type. These connectors conform to industry standards and will mate with any other type of standard D-sub. Solder bucket D-sub connectors can be fairly labour intensive, difficult to service in the field, and more prone to wire breakage than crimp style. 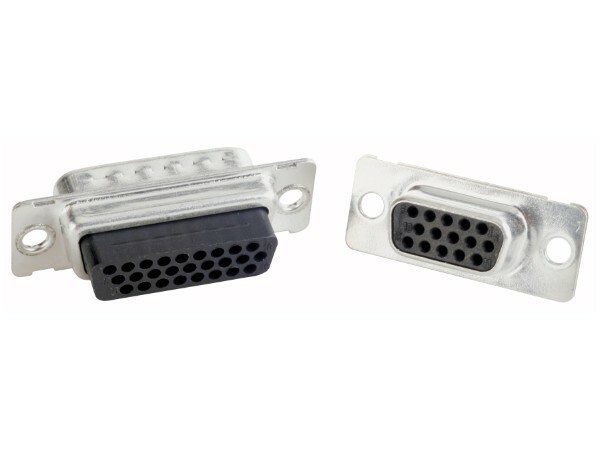 Crimp d-sub connectors are therefore much utilised in avionics or aircraft/helicopter electrical systems and are available with either stamped and formed or machined contacts. Suitable crimp tools, positioners, insert/extract tools are available but using the correct tools and settings is of paramount importance.